With Sarah Sheppard as a guide, the journey is both fun and educational. Learn about space flight, impossible missions and exciting research trips. Learn something new about the first moon landing, follow the dangerous race to be first to reach the South Pole, find out who the first explorers into the world's deepest oceanic trench were or where the pilot Amelia Earhart went. The books brims with fascinating facts, interesting anecdotes and humorous reflections. A must for all children who yearn for adventure and dangerous journeys, without having to leave home! 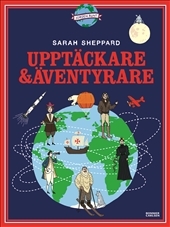 Sarah’s previous book, Important maps for daydreamers and adventurers, won the "Carl von Linné-plaketten" and was sold into 6 languages.